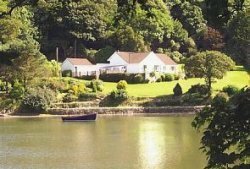 The Anchorage is probably the finest creekside rental cottage in Cornwall. 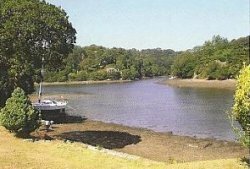 This fabulous, luxurious, waterfront home has a 200ft frontage to the Port Navas Creek on the Helford River and has it's own private beach, slipway, quay and dock. 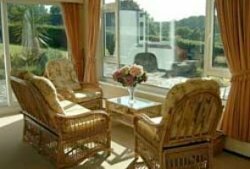 The cottage is set in 2 acres of stunning, sub-tropical gardens and woodland. It has a large west facing patio with glorious views of the creek and the hills beyond. The home can sleep 14 people and 1 infant and features 5/6 bedrooms, 2.5 bathrooms, a large lounge, a sunroom, dining room and a fully equipped kitchen & utility room. It has an open fireplace and full central heating. There are TVs in the lounge and 4 bedrooms and a large outdoor table, chairs and sun-loungers. The cottage has a double garage with a power door and extensive parking. 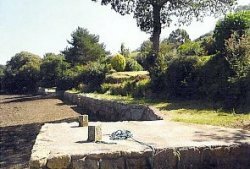 All the facilities of the adjacent Budock Vean Hotel are available to our guests including their fabulous indoor heated Swimming Pool and Health Spa, 18 hole Golf Course, Tennis Courts, restaurants and bars.